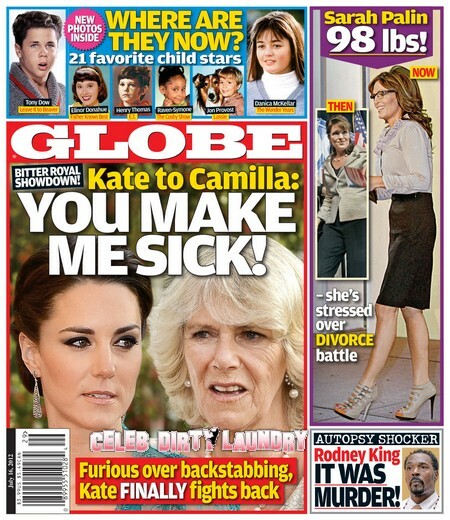 Kate Middleton has had all she can stand of Prince William‘s step-mother, Camilla Parker-Bowles, and has told Prince Charles’ scheming wife – ‘You Make Me Sick.’ This is the cover story on this week’s edition of GLOBE. It seems that the Kate is standing up for her husband in the bitter royal showdown over who will take the throne after Queen Elizabeth II. Kate has had it with Camilla’s backstabbing and is fighting back. As GLOBE has previously reported, Elizabeth initially favored Prince William to be King over his scandal-plagued father, Prince Charles. But the evil plotting of Camilla, who replaced William’s mother, Princess Diana, as Charles’ wife, managed to change Elizabeth’s mind. Camilla convinced Charles to push hard for the throne and convince the Queen that Will and Kate were too young for such a responsibility. At the same time Camilla was doing her best to charm Elizabeth and win favor. GLOBE’s cover also does a pictorial on 21 favorite child stars including Leave It To Beaver’s Tony Dow, The Wonder Year’s Danica McKellar, and Raven Symone from The Cosby Show. Should be fun having a look at these folks… a trip down memory lane. We also learn the shocking news in this week’s GLOBE that Sarah Palin is down to 98 pounds! The formerly robust Alaskan is stressed over her divorce battle and has apparently giving up eating. GLOBE saves the most amazing news for last! Rodney King was murdered! It seems his death was no simple accidental drowning after all – An Autopsy has apparently revealed that King met his end through foul play. We’ll have to read the details of what the autopsy discovered in the print version of GLOBE! Enjoy your reading of GLOBE this week – we certainly will! The cover promises informative and entertaining reading as we get the inside scoop on stories ranging from the royal feud between Kate and Camilla to the truth behind Rodney King’s murder.